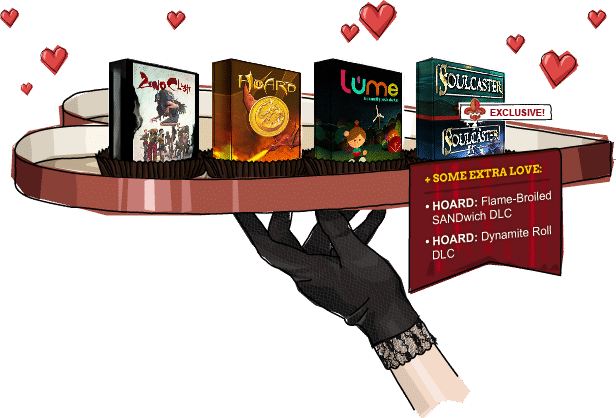 Give a little indie love on St.Valentine's day with this royale bundle of games. The Indie Royale game bundle site returns with the Valentine's Bundle, offering five stellar titles gamers can enjoy now, or gift to their Valentine to arrive on Valentine's Day. A particular highlight of this bundle is Ace Team's fantastical first-person action-adventure Zeno Clash (on Steam for PC). Using Valve's own Source engine, and dubbed as 'Dark Messiah meets Double Dragon', its unique first-person fighting gameplay and exotic setting helped earn an Independent Games Festival nomination for excellence in visual arts in 2009. Another visually stunning, IGF-nominated game in the Valentine's Bundle is State of Play Games' beautiful puzzle adventure Lume (on Steam for PC and Mac, Desura for PC and Linux, DRM-free PC, Mac and Linux download). Lume was filmed on a real-life set built entirely out of paper and cardboard. In this first episode, players navigate their way through puzzles to restore the power to grandfather's house and uncover a deeper mystery behind the town's blackout. Moving on, a Valentine's bundle wouldn't be as hot without some fire. Therefore, Big Sandwich Games offers its scorching single and multiplayer arcade-strategy game Hoard (on Steam for PC and Mac). Players control a fire-breathing, high-flying dragon whose job is to hoard as much gold as possible, while destroying merchant wagons, buildings, and anything else that attempts to steal its stash. Making this Bundle even sweeter, two extended-play Hoard DLC packs (individual Steam codes for both PC and Mac) are unlocked at bundle start. Dynamite Roll! and Flame-Broiled SANDwich! offer players lots of new maps, enemies, powerups, achievements, and even an entirely new desert continent to scorch and scour. Finally, Indie Royale is presenting the world premiere PC versions of retro RPG-defense games: Soulcaster I and II (on Desura for PC, and DRM-free PC download). Acclaimed indie developer MagicalTimeBean offers up two fast-paced dungeon adventures, where players tactically summon the powers of immortal warriors to battle hordes of monsters, discover secrets, collect treasure and buy powerful upgrades for their immortal allies. As before, the Indie Royale bundle series runs on a five-day model where the price will automatically increase as more people buy the bundle. Generous purchasers, however, who choose to pay more than the current minimum will earn One Life Left's eclectic 'Music To Play Games By Too' compilation, available for the first time ever digitally. Indie Royale was co-created by Gamasutra sister site IndieGames.com and independent game download service Desura. More information on the Valentine's Bundle, including real-time statistics and its current price, is available at its official website or via its Facebook and Twitter pages - and remember check back during or after the bundle for more special bonuses for all buyers. nom xenoclash, will give the others a whirl too. Don't buy it for HOARD - developers have a horrible attitude, and judging by what I saw on their forums etc in the past, they're a develop-release-dlc-and-run kind of company, with bugs being left unattended and many demanding their money back from Steam. Not saying obsidian is wrong but you guys shouldn't jump the gun over a single comment, without sources. Of course, which is why I mentioned their forums, so that readers will go see for themselves. i think you are developer of Lume. google lume game short and see results yourself. that game offers only, yes only one hour play, they price 7 dolars for one hour cartoony graphics for meh puzzles. that game is just shite. there are waaaay better free puzzle games, just donate that 10 dolars to them mr lume developer. Well, I hadn't completed it yet. Didn't know it was that short, haha. It' still one of the prettiest games I've played, and the puzzles are fun. why dont u guys sell coop games on valentine? right. bundle of two for you and your gaming buddy to play on Valentines day.